Keyes Peak Recreation Area in northern Wisconsin has added another new attraction; a disc golf course running up and down Keyes Peak. This free course winds through the northwoods and along the ski slope with holes ranging from 137 foot par 3 to a 420 foot par 4. Par on this 9 hole course is 29. The signature hole, #7, starts at the top of Keyes Peak with a beautiful view of Keyes Lake and the Ski Lodge down below. This hole boasts the longest vertical drop of any disc golf course in Wisconsin and offers a great fall colors photo-op. 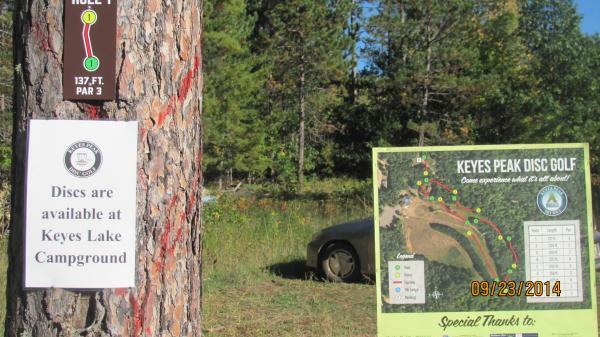 If you don’t own your own discs, you may sign out a set of discs from Keyes Lake Campground located next to Keyes Peak. To access the course, take Hwy 70/101 south from Florence for 2.4 miles. Turn left to stay on Hwy 101 for 0.8 mile then turn left at the sign for Keyes Peak Disc Golf Scenic Overview to a parking area. For additional information, course maps and other courses in our region go to www.dgcoursereview.com and search on Keyes Peak Disc Golf. The Course map can also be found in the recreation guide of this website under Disc Golf.